There is nothing quite worrying like unintentionally deleting an important email. With the availability of different devices, you can use to access your email accounts, a simple swipe done wrongly can lead to the deletion of your important emails. You might have deliberately deleted emails in bulk in an attempt to free up some space only for you to realize that you have deleted an email that you should not have. Whatever the reason, the end result is the same – wishing you never deleted them in the first place. We are going to show you how to recover deleted emails. Most people use Gmail, Outlook, Hotmail, and Yahoo mail messages to send and receive emails. These email programs are designed to help users communicate through email with ease and convenience. Each email program has its advantages and disadvantages depending on the user’s preferences. However, when it comes to recovering deleted emails, each email application has its own unique way of how to recover deleted emails. We are going to help you learn how to recover deleted emails from Gmail, Outlook, Yahoo Mail, and Hotmail. Step 2: Tap on Show Trash. The trash folder will be opened and you will be able to see all the deleted emails in the folder. Step 3: Select the emails you want to recover and then click on the Move to mail icon found at the top part of the Gmail window. 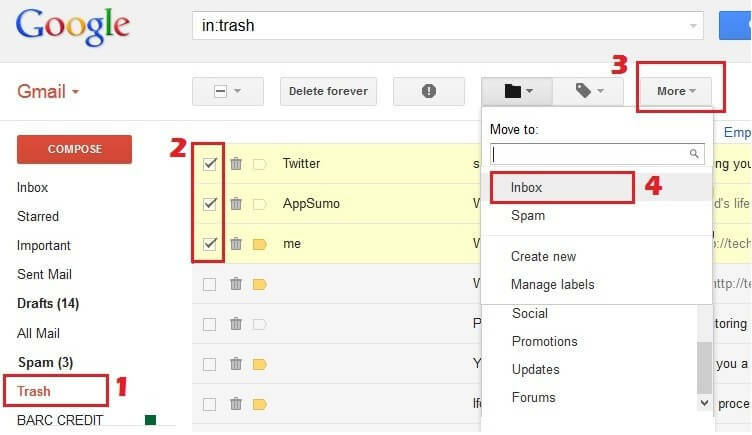 Step 4: Scroll down to find Inbox among the options available and then click on the Inbox option. This will move the selected files from the trash to the inbox folder. Open your inbox folder and you will find them there. Step 1: After you have signed in to your account, select the Deleted Items folder in the Outlook.com window. Step 2: Click on Recover Deleted Items found at the top of the Outlook window. Step 3: A box will appear with a list of deleted files. Step 4: Select the emails you wish to recover and then tap on Recover Selected Items. Step 1: Sign in to your Hotmail account. Step 2: Click on the Deleted folder located in the left panel of the Hotmail window. Step 3: Tap on Recover deleted messages. This will retrieve the deleted emails. Step 1: Sign in to your Yahoo mail account and locate the Trash folder and open it. Step 2: Click on the deleted email and select the messages you wish to retrieve. 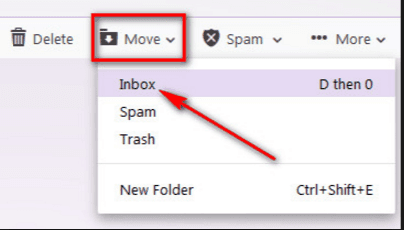 Step 3: Click on Move option in the Yahoo mail toolbar and choose Inbox. Go to your Inbox to find the email there. Step 4: Alternatively, drag and drop the email from the Trash folder to any other folder by simply pressing DO. In addition to the email recovery method, you should also know how other data loss should be recovered. There is one-stop solution for all data loss situations that you can get your data back anytime anywhere. AnyRecover is your ultimate solutions for data recovery. This is a powerful tool and helpful for recovering files in various storage devices. Recover all files deleted or lost on all types of data storage media including hard drive, digital camera, memory card, flash drive, and USB drive. Supports more than 1000 data formats including pictures, videos, word documents, excel, zip and other file types. Recovers data files 100 percent safely without overwriting the original data in just simple steps. Saves important files from severe data loss for computers, mobile phones, memory cards, Hard Drives, Camcorders and cameras. 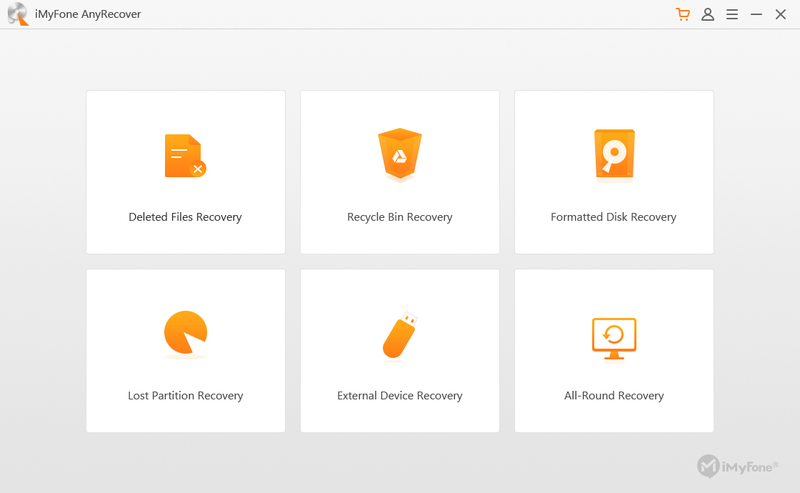 Step 1: Download and launch AnyRecover data recovery tool and choose a suitable mode to restore your data according to your actual needs. Step 2: The next step is to select the location of your lost file. Step 3: And then choose the file type and click “Scan” to start find your lost data. Step 4: When it finished, you can choose to preview before recovery. Click “Recover” to get your files back anytime when you are ready. If you have accidentally deleted your emails, worry not because it is not permanently deleted from your email program. 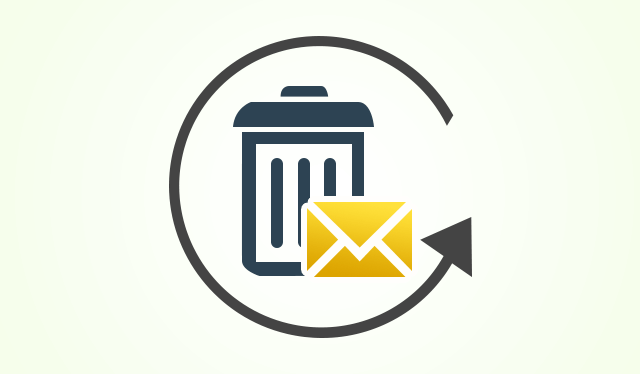 Simply use the above ways on how to recover deleted emails and get back that important email.